The Bud Selig East came down to a battle between the champions of the Joe Cronin and Chub Feeney Leagues. In the end, the Chicago White Sox out of the Cronin prevailed, beating the Reds by 1½ games. Oddly enough, the White Sox and Reds never played each other, even though the interleague schedule in the Major Leagues pitted the Central divisions of each league against each other. For the second straight year, the winners of the Joe Cronin and Chub Feeney Leagues were in the same Bud Selig division, the Bud Selig East. 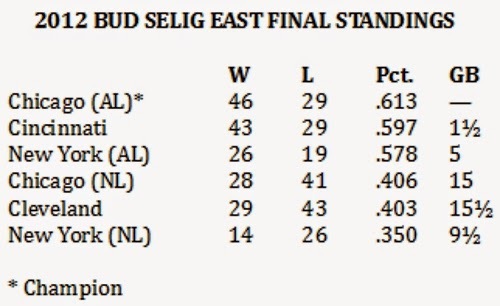 So, it was a close race between the Chicago White Sox and the Cincinnati Reds for the Bud Selig East title. The White Sox prevailed by 1½ games. The Reds and White Sox should have played each other in 2012, as the Major League interleague play schedule put the AL Central against the NL Central. But the Reds, for whatever reason, didn't play the White Sox. Instead, they played the New York Yankees. And the Sox, instead of playing the Reds, played the Dodgers. The Reds and White Sox played out a tight race even though neither club was especially good in interleague play. The Reds were 6-6 against teams from the Joe Cronin League and the White Sox were 7-8 against clubs from the Chub Feeney League.